The Irish Free State (comprising the 26 counties of former Southern Ireland) became a British dominion in 1922. When formally proclaimed the Republic of Ireland in 1949, it left the Commonwealth but retained the main advantages of membership. Britain’s diplomatic relations with Ireland therefore continued to be the responsibility of the Commonwealth Relations Office. Sir Gilbert Laithwaite, a deputy under-secretary in that office, was appointed to succeed Lord Rugby as the United Kingdom representative in Dublin in 1949, a post that changed to ambassador in 1950. Since 1939, the representatives had a residence called Farmhill, in Dundrum on the southern outskirts of Dublin, leased from the Somerville-Large family on a succession of two-year terms. By the time of Laithwaite’s arrival in 1949, Farmhill was proving too small and awkward, and too closely surrounded, for a Post of the importance that Dublin was becoming. Laithwaite began searching for a more suitable alternative: he was spoilt for choice because the estates round Dublin were being subdivided and sold off for housing, bringing the main houses, each with a few tens of acres, on the market as well. But few of the fifty or so houses that were brought to Laithwaite’s attention had, he thought, the makings of a satisfactory residence, and none was priced to appeal to the Treasury. Nor were there town houses or suburban possibilities available. 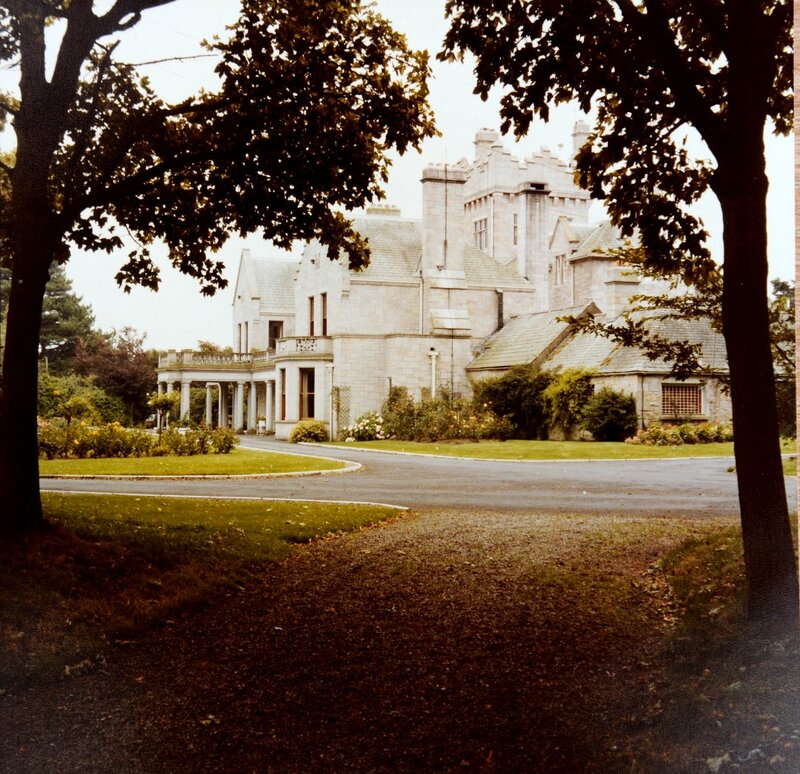 The most promising country house was Glencairn in Leopardstown, about seven miles outside Dublin. It was large and ugly outside and ‘horrible inside, but £5,000 might put that straight’, Laithwaite told London. 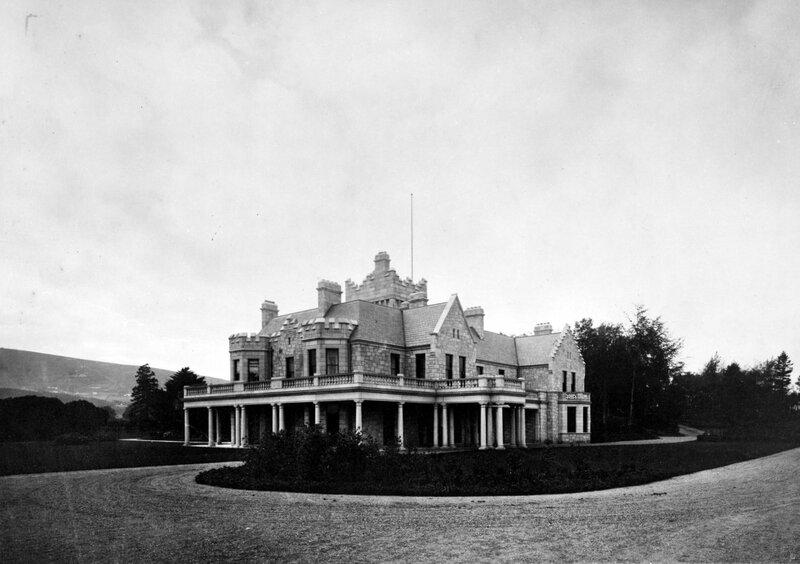 The Glencairn estate had been bought by Richard Croker on his return to Ireland in 1902 after making his name and fortune in New York City, for the last fifteen years as boss of Tammany Hall, the Democratic Party’s political machine. Croker laid out extensive stables at Glencairn and became a racehorse owner, winning the Derby in 1907. He enlarged and embellished the house in 1904, using as his architect JF Fuller (1835 – 1924). Attention wandered away from Glencairn during 1950 because the search changed to land on which to build a new residence. The grounds of Leopardstown Park Hospital were favoured, not least because they were owned by the British Ministry of Pensions, but there was no momentum. 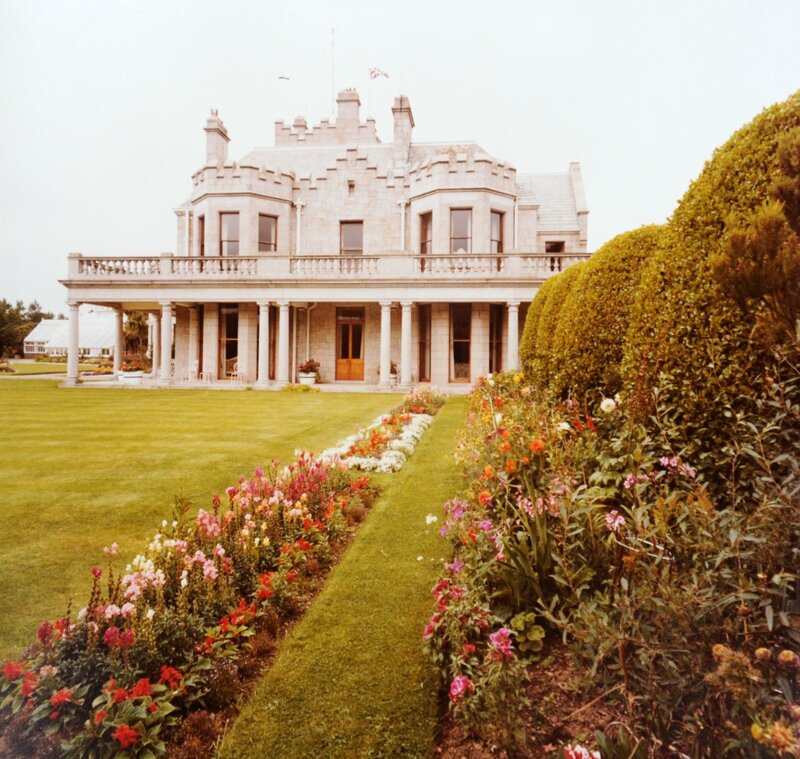 Sir Walter Hankinson succeeded Laithwaite in 1951 and started another search for a country house, the Farmhill lease having once more been renewed. He was in turn succeeded in 1955 by Alexander Clutterbuck, whose wife was so incensed by the drawbacks of Farmhill that yet another search was instituted. It succeeded in 1955 in re-identifying Glencairn as the front runner, then standing in about 33 acres of ground, about half of which was leased for grazing. The Treasury gave approval for its purchase within £30,000 in mid-1956, with further provision of about £5,000 for necessary ingoing works. 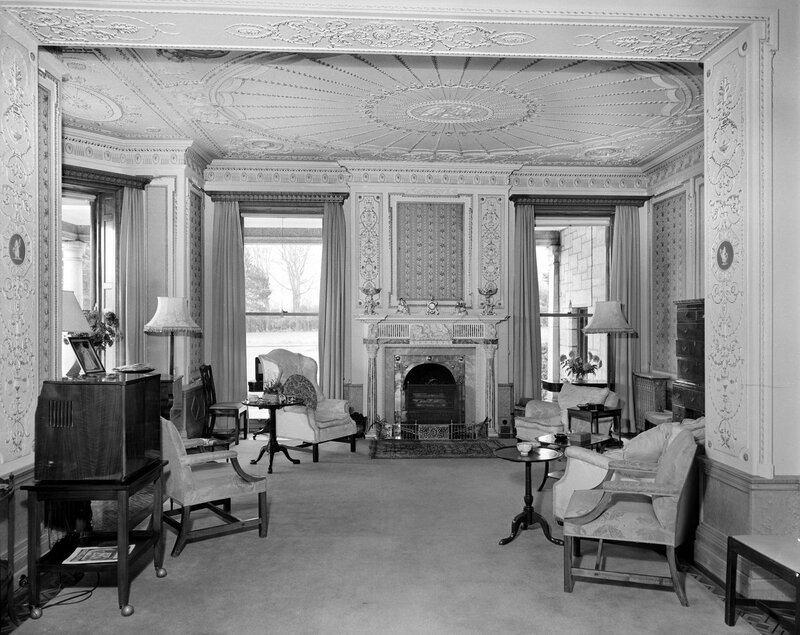 The purchase, from Mr and Mrs Michael O’Neill, was completed in 1957. Glencairn served well as the residence for the rest of the century. Although its comparative remoteness, and the wide security cordon provided by its land, had some advantages from a security point of view, the roads into Dublin contained some vulnerable spots and at one of these the ambassador, Christopher Ewart Biggs, lost his life in 1976 when his car was blown up by a landmine. 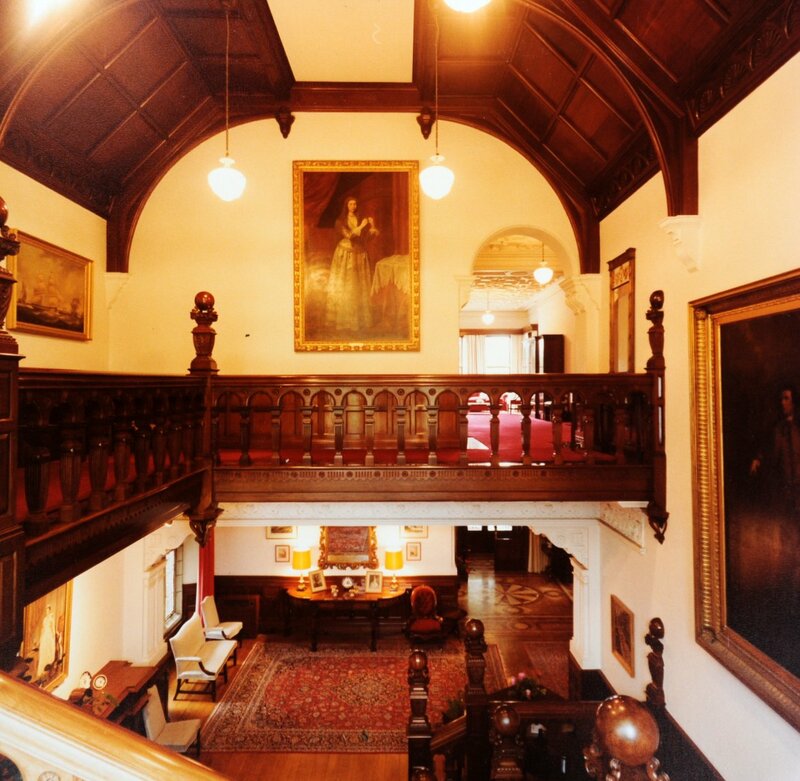 By 2000, Glencairn was considered disproportionately valuable for its purpose, mainly on account of the potential of its land for house-building, and the FCO, under severe financial pressures, decided to sell. In its impatience, it had not yet secured an alternative residence and so negotiated the option of a leaseback of the Glencairn house itself (with only a little of the land). A nearby house, Marlay Grange, was bought in 2002 as a potentially suitable alternative residence once extensive refurbishment was completed, but sentiment and finance conspired against the move, and it was, embarrassingly, sold without being occupied in 2007. Glencairn remains the residence. Viewed from the north, 1980s. From the south east, 1980s. The representative’s offices had been leased since 1939 at 50 Upper Mount Street. 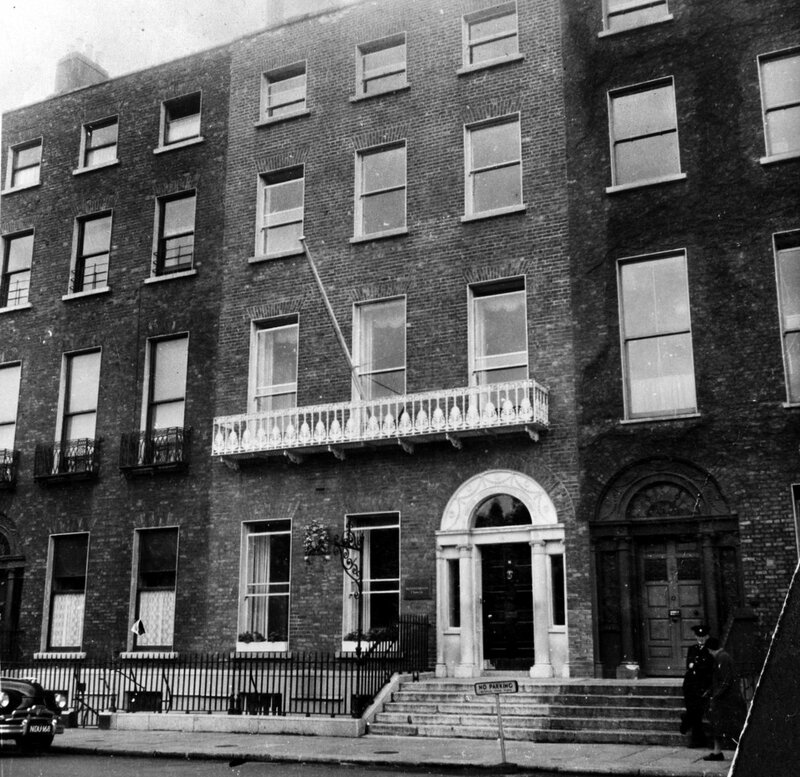 In 1952 they moved to 39 Merrion Square on a lease for twenty years. By 1960 the embassy occupied two others of the Square’s tall Georgian row houses: No. 39 housed chancery and the Service Advisers; No. 24 was leased for 10 years from 1957 for the Ministry of Pensions (and Hangers, a firm of limb fitters, was a sub-tenant on the top floor); and No. 30 was leased for 10 years from 1960 for the Trade Commission, passport staff, and Pensions Appeal Tribunal staff. The intention in the mid-1960s was to co-locate all the offices in one building and an unsuccessful search for this took up much of 1966. In the following year, the idea was mooted of building new offices at Raglan Hall on Clyde Road, in Ballsbridge. The ambassador, Andrew Gilchrist, suggested including a new residence and others proposed the inclusion of staff flats as well: these considerations lasted through 1968, with a builder/lessor scheme in mind. The ambassador pressed for an ‘outside architect’, and on 25 July 1968 there was a letter in The Times about being as innovative in Dublin as in Brasilia. The schedule of requirements progressed through 1969 in the haphazard manner of the time, while the Treasury was non-committal while waiting for the Duncan Report. Extending the leases in Merrion Square remained a possibility but the physical security of buildings that opened directly on to the street was called into question and an alternative location was preferred. Nothing was decided by 2 February 1972 when the building at 39 Merrion Square was burned down after a petrol bomb was thrown at it by an angry crowd. 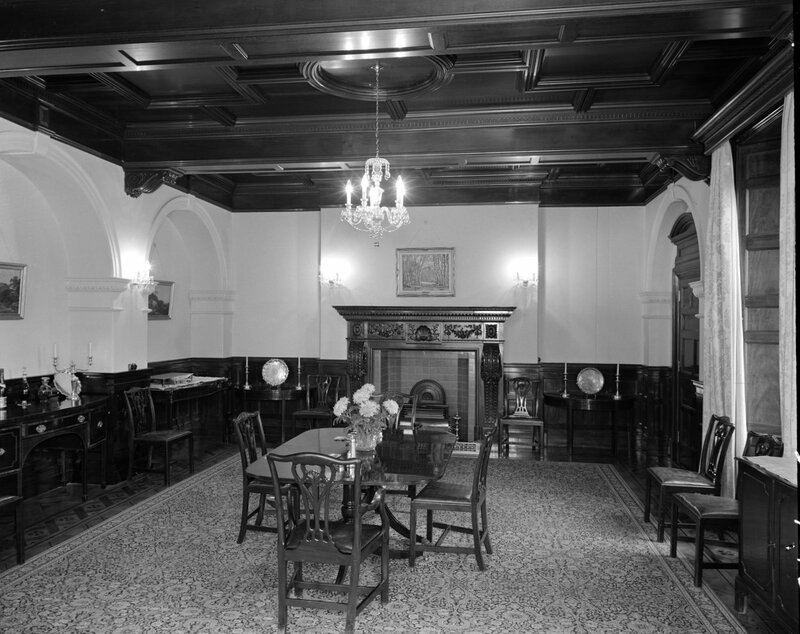 The chancery offices moved immediately into the residence at Glencairn, where the wine store became the cypher room and some of the first floor bedrooms became offices, while the Service Advisers remained in the untouched rear portion of 39 Merrion Square. A large house called Earlsfield at 33 Merrion Road was bought in 1973 and chancery and the Service Advisers moved into it in 1974. The Irish Board of Works eventually agreed to reinstate the burned out No. 39 Merrion Square to the extent that the lease required, and to pay compensation for the furnishings, tenant fittings and equipment which were destroyed. By the late-1970s, security arrangements around and within Earlsfield needed strengthening and the adjacent property, No. 31 Merrion Road, called Ardoyne, previously the Swedish embassy, was bought from the Swedish government in 1981 in order to provide more perimeter security. The pressures for a new embassy that would be both secure and capable of bringing all the offices into one building were increasing during the 1980s. In 1987 the FCO was able to buy for this purpose 29 Merrion Road, the 2.4 acre site next to Ardoyne, from the Royal Dublin Society. 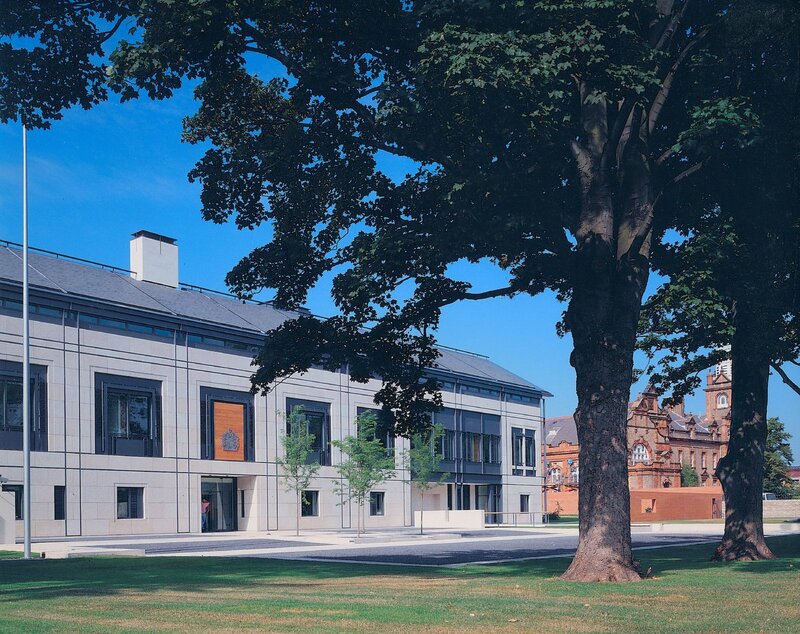 In 1990, the architectural practice of Allies and Morrison won the limited design competition with an elegant and calm building, which was completed, by Pierce Contractors, in 1995, and opened by HRH The Princess Royal. Nos. 31 and 33 Merrion Road were sold shortly afterwards. I am grateful to Sir David Blatherwick for his help with this entry: he was ambassador 1991-95 and, twenty years earlier, had been the last man out of 39 Merrion Square after the bomb attack. 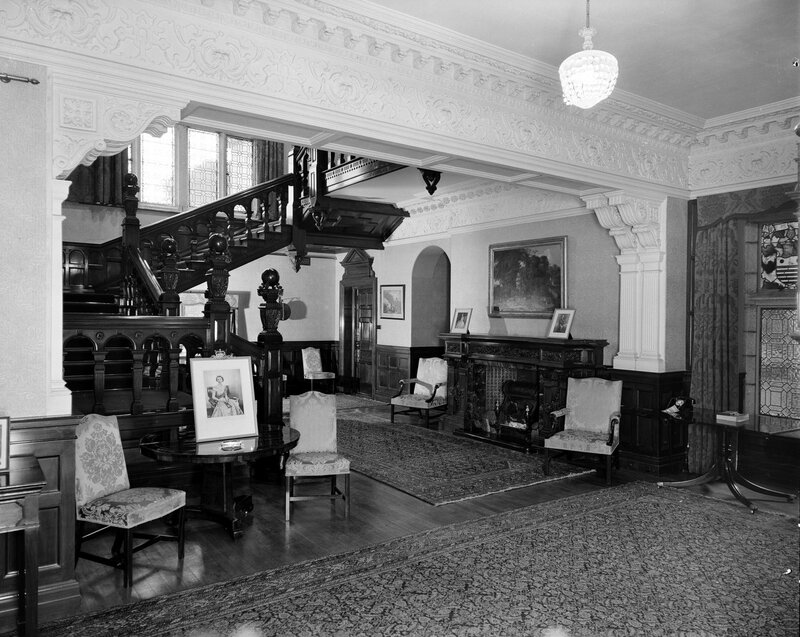 39 Merrion Square, after restoration after fire, 1972. 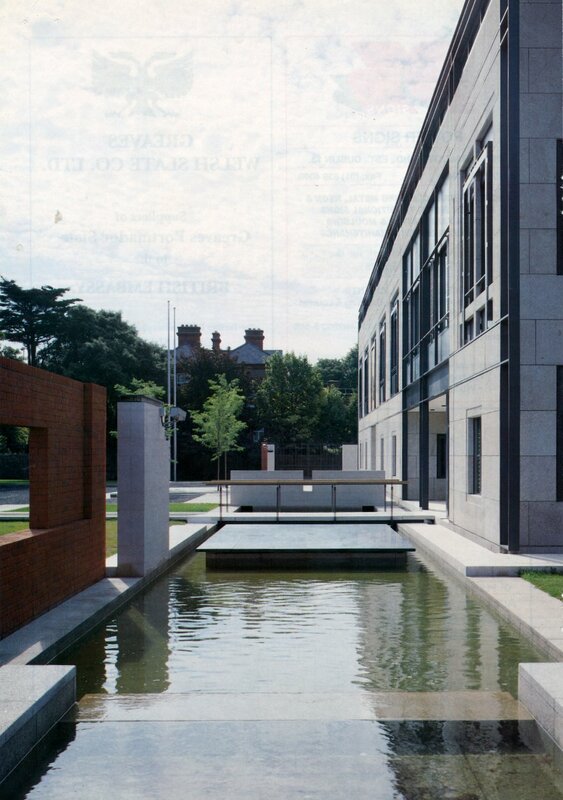 The moat across the office front, 1995.